Halloween is the best for kids. The best! Which means that your kiddos' schools are going to be throwing some super fun Halloween parties. What's so super special is that after the party is over, it's Halloween AND the weekend. Could it get any better than that? Your little one might be more concerned with what happens when they get home from school, but part of the fun of Halloween is sharing the excitement with their classmates and teachers. Also, it's pretty cool to not be learning for a few hours. Get your child excited about the celebration by making some fun, Halloween-themed treat bags for all of his or her classmates. You'll look a super mom and no one will ever have to know that it only took you a couple of bucks and a few extra minutes in front of the TV. 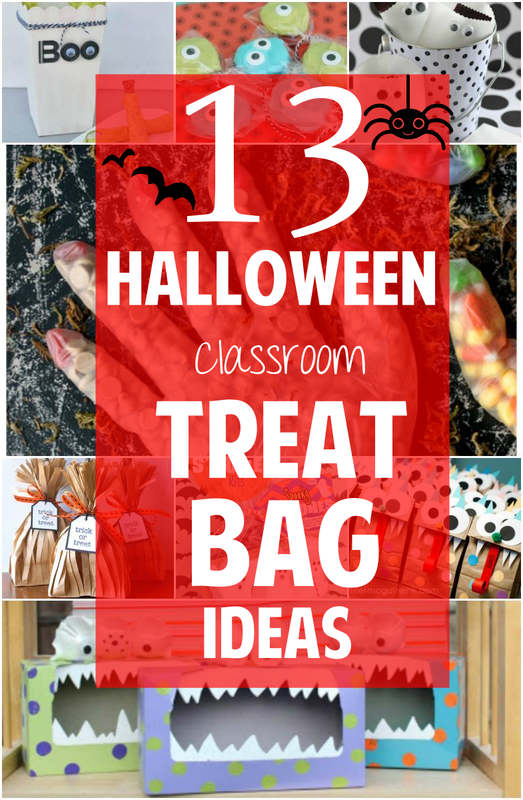 Whether you're planning on joining in the festivities at your little one's school or sending some Halloween treats off to school to share with their friends, we've collected some of our favorite creative, budget-friendly treat bag ideas. Some involve candy and treats, and some involve fun activities. 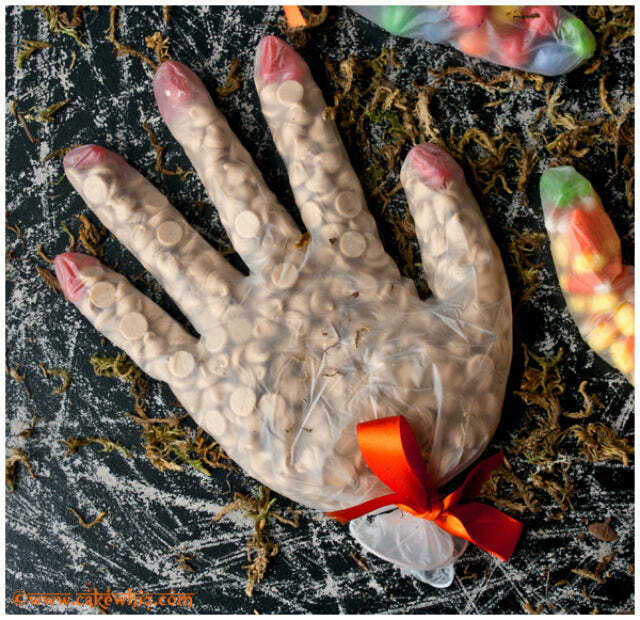 These Halloween glove treat bags are the perfect balance of creepy and creative, and the older kids in elementary school will probably love them. Fill them with anything from gumballs or M&M's to peanuts and chocolate chips. Just make sure what you put in first (where the fingernails should be) are different colors. Abeer from Cake Whiz uses non-latex gloves (the kind that aren't totally see-through), decorative ribbon, and candy for this budget-friendly Halloween treat craft. Get the rest of the tutorial here. 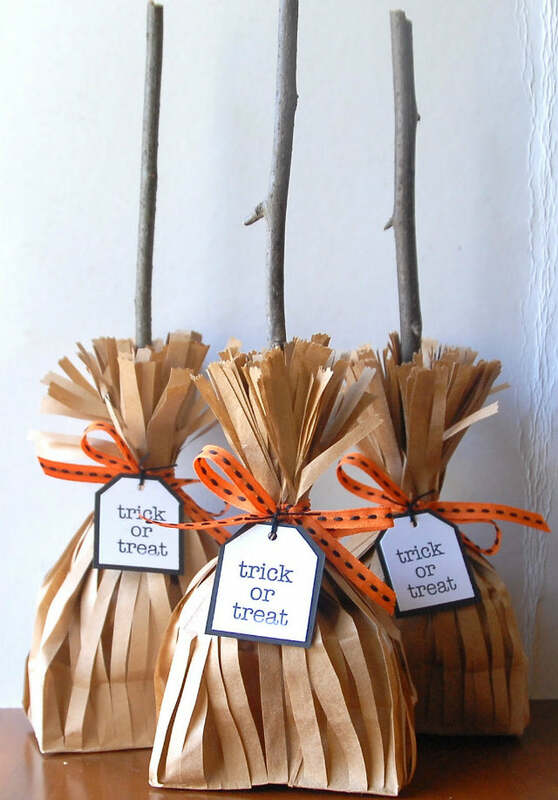 We have to tip our witch's hat off to the Two Crafting Sisters...this treat bag idea is creative! Make some of these for your kid's classmates and it will look like you did much more work than what actually went into making them. All you need are two brown paper bags per student, some decorative ribbon (or twine), and a branch. Cut one of the bags into shreds (while keeping the base together) and wrap it around the other bag that's still intact.Super cute and easy, right? Plus, it's affordable. Get the rest of this super creative tutorial here. In some districts around the country, schools don't allow kids to bring treat bags for their classmates, even though it's been proven that candy tampering is more of a myth than a threat. Better safe than sorry, we guess. 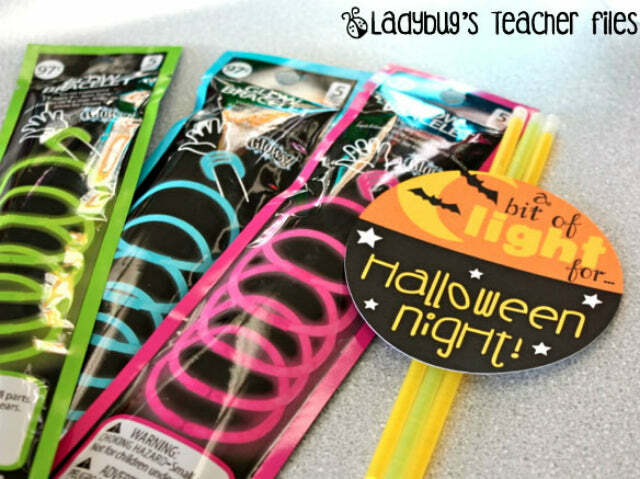 Kristen from Ladybug's Teacher Files is a teacher herself, so we're betting that her Halloween Glow Stick Gift would pass the threat test. Her treat alternative idea was putting together some cute neon glowsticks to help light the way for children when they're trick-or-treating at night. Teachers have a knack for making cute crafts without breaking the bank or breaking their backs. Thank goodness for the teachers in the world. Get the details of this cute idea here. Here's another non-edible treat you can give your little one's classmates, and it's a craft that they can do at home. Your kid's classmates' parents will thank you. Using Elmer's glue, some glitter, and a little bit of Borax (how versatile is that stuff?! ), kids can make their own monster slime. Just don't forget the how-to card that goes along with the gift. It's included as a download in the tutorial. Check out how Kim put her kit together here. Who doesn't love cookie or cake pops? This is a great last-minute treat for your kids' classroom. 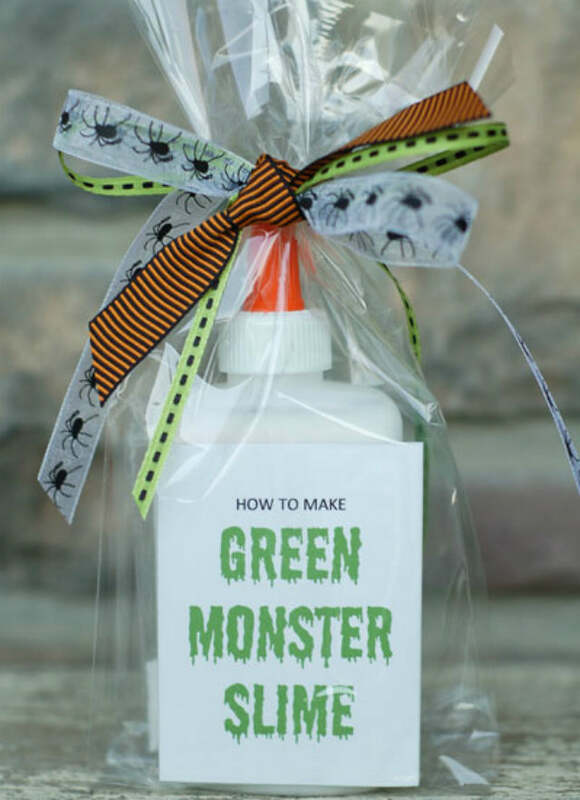 Angie from the Country Chic Cottage has done it again with these super-easy monster classroom Halloween treats. Grab some sandwich-style cookies (if you want to save money, go store-brand...they'll never know the difference) and dip them into some colored candy melts. 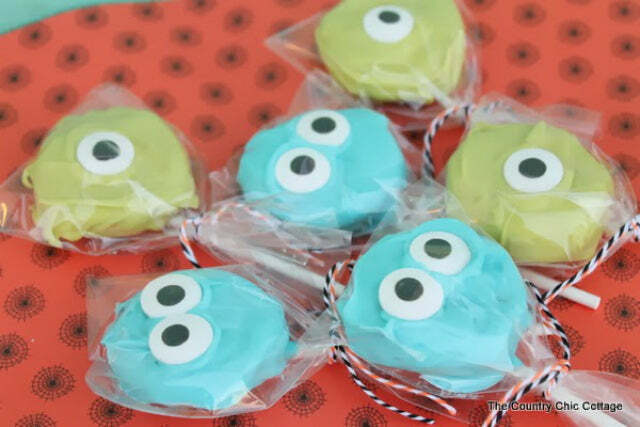 Add candy eyes (or white candy melts with chocolate chips on top) and wrap them up! These googly-eyed ghost bags are easy and versatile. 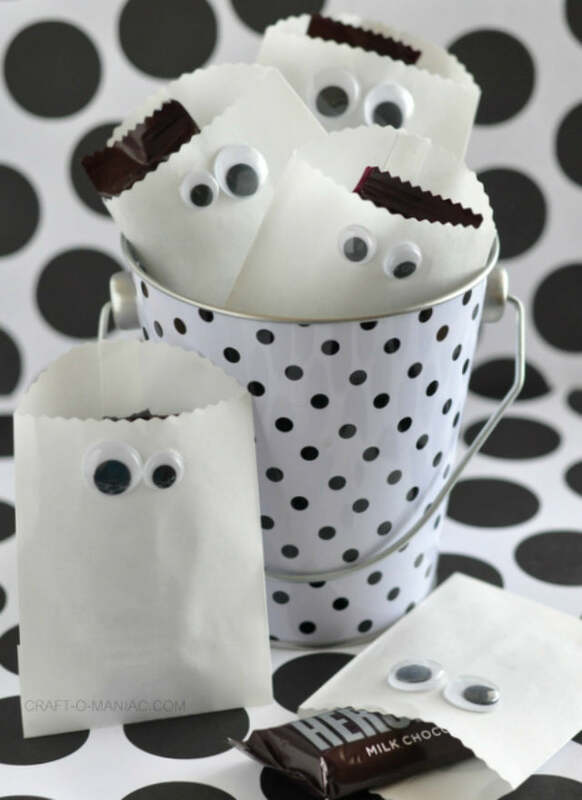 Grab some plain, white paper bags and some different sized googly eyes for a cute and friendly treat bag perfect for the little ones who might be scared of the creepier aspects of Halloween (ie fake blood and severed body parts). Get the scoop on these ghastly bags here. Here's another great gift bag idea for when you're short on time. 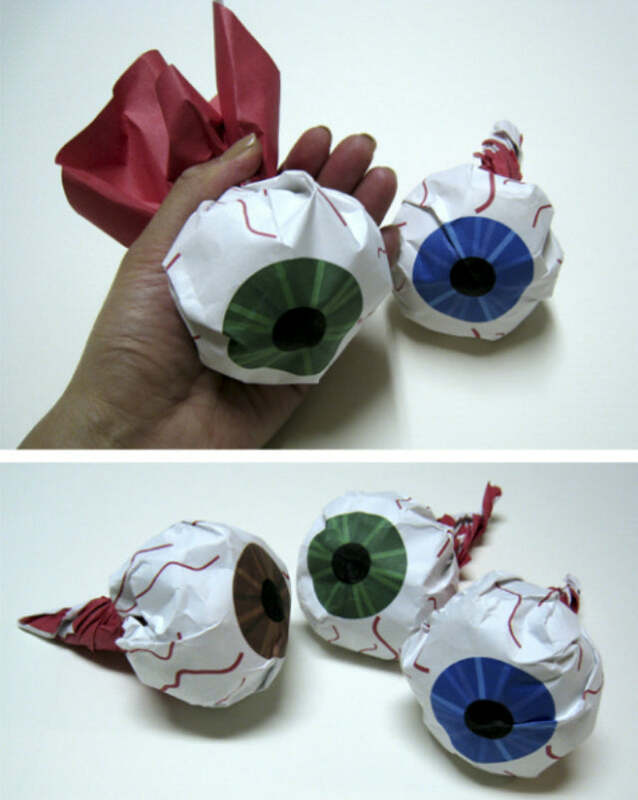 Jeromina from Paper Plate and Plane provides you with three downloadable templates (in all 3 colors) so you can print the eyeballs out. Each 11x11 design can hold up to 7 pieces of mini sized candy bars. Simply print out the designs, place your candy and treats in the center, and twist the corners together. Super creepy. We think it could be done even better if you tied the ends off with a decorating ribbon and a tag that says, "Here's Lookin' At You!" or something equally (or more) punny. If we've learned anything from Pinterest, it's that s'mores aren't seasonal. If they were in the past, too bad. Pinterest made them year-round snacks. 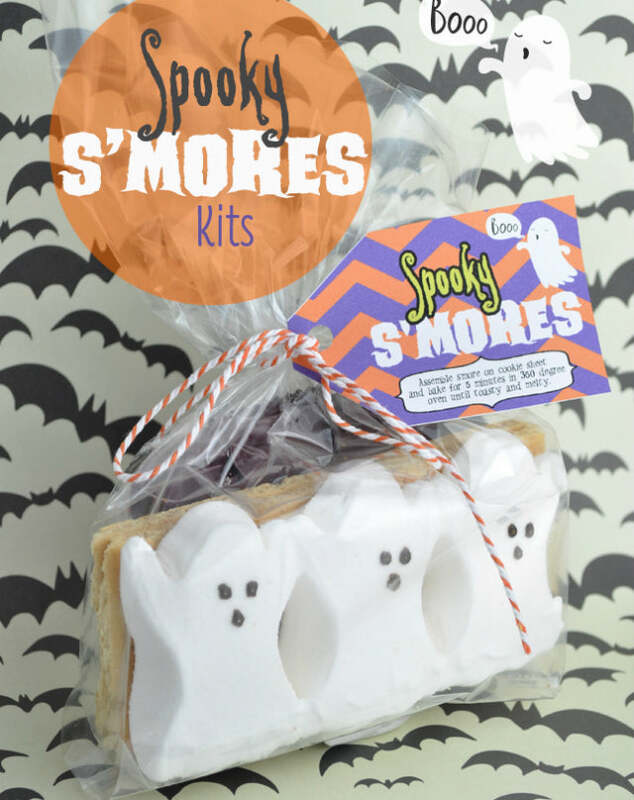 Pauline from Chica Circle managed to find some ghost Peeps and decided to make some adorable Halloween S'more kits. Gather up your s'mores ingredients and some small plastic bags and start stuffing. When you're done, staple some tags on the tops of them and send them off! You can download the super cute printable labels on the blog. Get the tutorial (and printable) here! 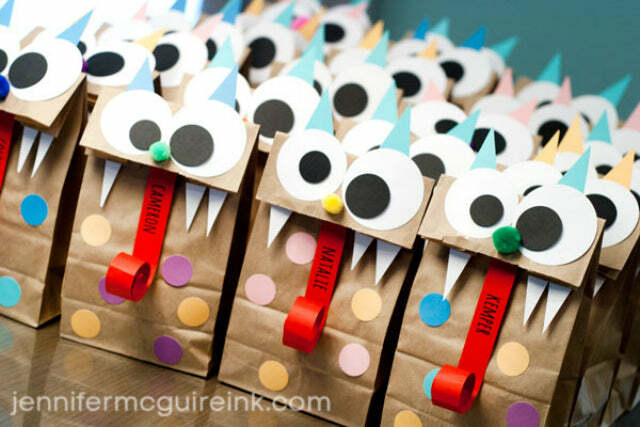 This Halloween classroom treat favor is probably best suited for older kids. We think it would probably be a huge hit with 2nd-4th grade boys. The look of itmight creep you out, but it's actually a deconstructed cake in a jar. 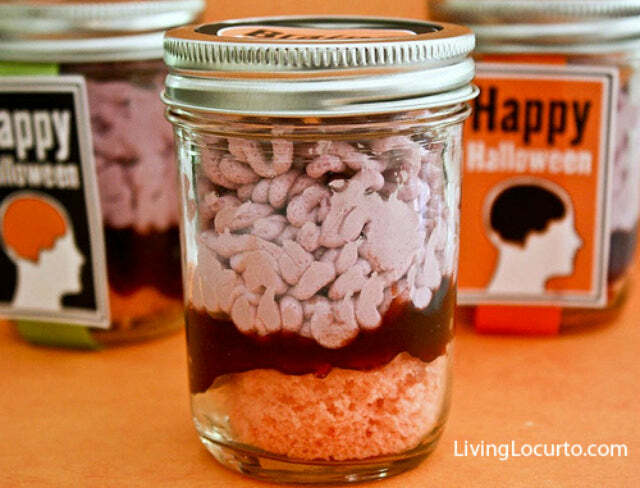 Kristen Roland made these adorable (and disgusting) brains in a jar crafts for Living Locurto by layering cake, icing, and jam in a mason jar. The cake goes on the bottom, jam in the middle, and piped icing on top. The piped icing really takes the cake on this craft. These monster bags are so easy and fun to make. Jennifer from Jennifer McGuire Ink went the extra mile and customized every bag with a student's name. Jennifer added circle punches for the spots and eyes, a pompom ball for the nose, and a curled up piece of cardstock for the tongue. Inside of the bags, she included DIY coloring journals as well as some stamps and ink. Get the rest of the tutorial and more cute pictures here! Tauni from Snap Creativity combined all of the best Halloween candy (candy corn M&M's, anyone?) 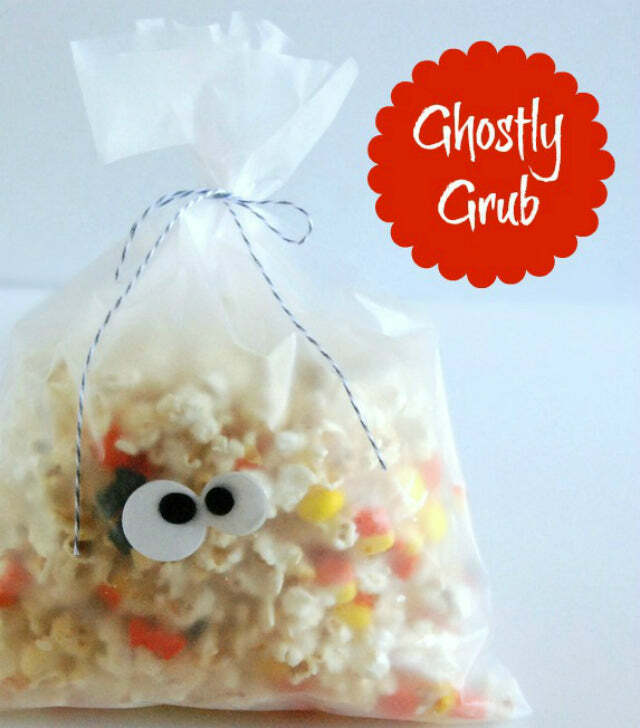 with unflavored popcorn to make this delicious "Ghostly Grub" to send off with her kids on Halloween. Put the Ghostly Grub in some bags, or translucent white boxes like Tauni did. The combination of melted chocolate, candy, and popcorn is sure to be a hit at your kids' school. Get the recipe and tutorial here! These things might look gross, but they're actually delicious and perfect for your older kid's classmates. Angie from The Country Chic Cottage gives a tutorial on how to make the witch's fingers, along with the box they go in. You can always customize your own box or bag, though. To make these witch's fingers, Angie used pretzel rods and green candy melts for the finger and sliced almonds for the fingernail. 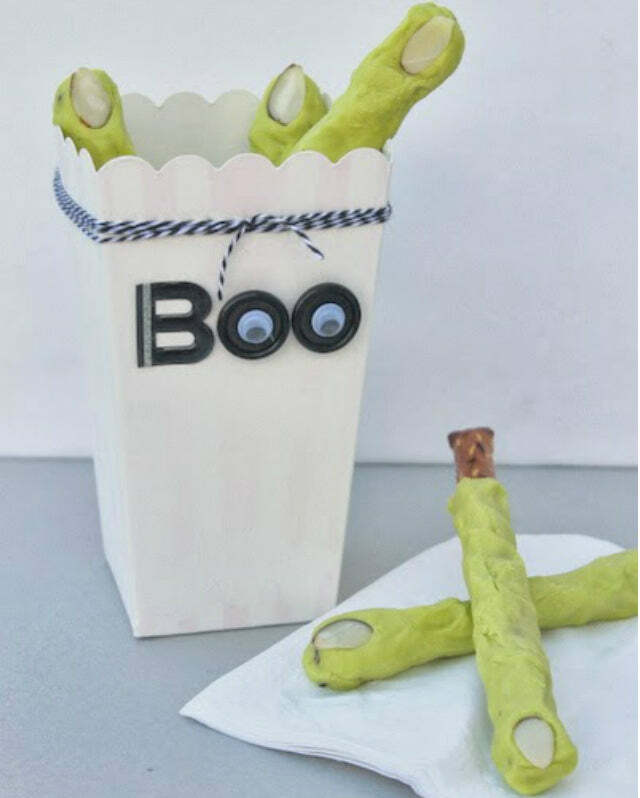 For the box, she used a personal-sized popcorn box, spray-painted it white, and added "Boo!" and some decorative ribbon. Get the full, creepy tutorial here. These adorable monster tissue boxes were initially made to be "tattle boxes" for when one of Mariah from Giggles and Galore's kids wanted to tell a tattle, but we think they could also make great treat boxes for a classroom or kid's birthday party. Mariah made these monster boxes using recycled tissue boxes and egg cartons as well as some paint, foam board, and googly eyes.Get the full tutorial here. Now you've got a bunch of killer ideas on how to make treat bags to hold the kids Halloween candy.